You don't have to head far out of Ipswich , especially in winter, to find yourself alone. Newbourne, sometimes spelt Newbourn, is barely a mile from the busy Foxhall roundabout on the A12, but the road into it is single track, with passing places. When you get there, you find a village which is a little different from most, because in the 1930s it became the home of the utopian Land Settlement Association, a community of market gardeners from the deprived coal-mining areas of Yorkshire. It still stands out on an Ordnance Survey map because of all the glass houses. The LSA came to an end in 1983 and now most of the greenhouses are operated by local nursery giants Notcutts. The Fox is one of the best village pubs in the Ipswich area, we love to sit outside it on a summer weekday afternoon when we can, and let time pass. Above it on a hill is the rather lovely old church. 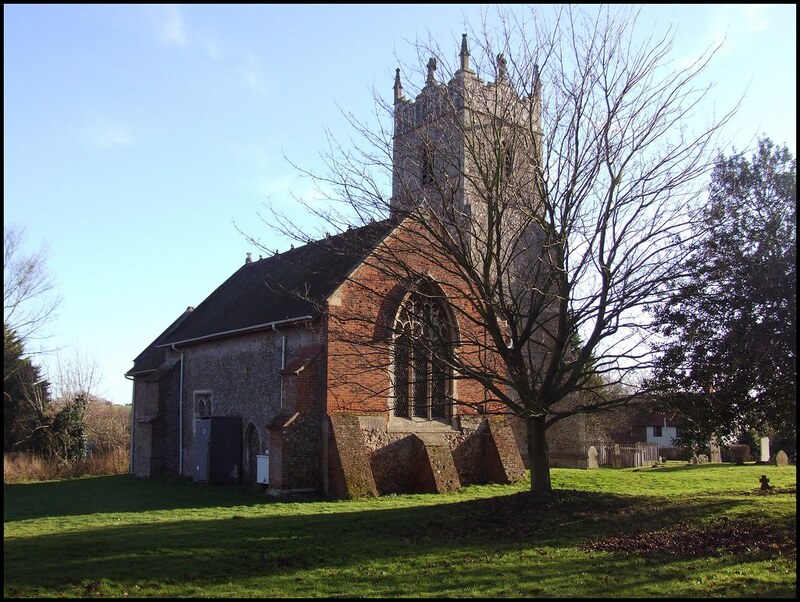 Near neighbours Waldringfield and Hemley both have red brick towers, but Newbourne's is of flint, and St Mary has one of Suffolk's south towers, forming the entrance porch and bellringing chamber. Bell ropes hang down inside the entrance, as at Timworth. At first sight, from the south, the positioning of the tower is not immediately apparent, because a chapel from the south aisle forms a redbrick wall against the tower. 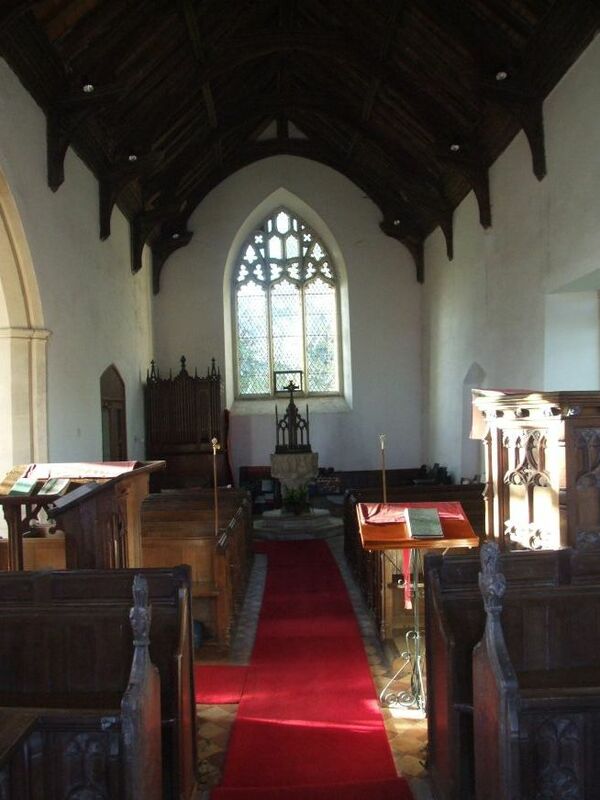 You might think at first that this is a small church with a larger, later nave built on to the north. The west end of the nave is heavily buttressed, possibly to stop it heading to join the pub at the bottom of the hill. St Mary, famously, had its east end blown out in the great storm of October 1987 (the same happened to Uggeshall). No attempt has been made to restore its former Victorian broodiness. 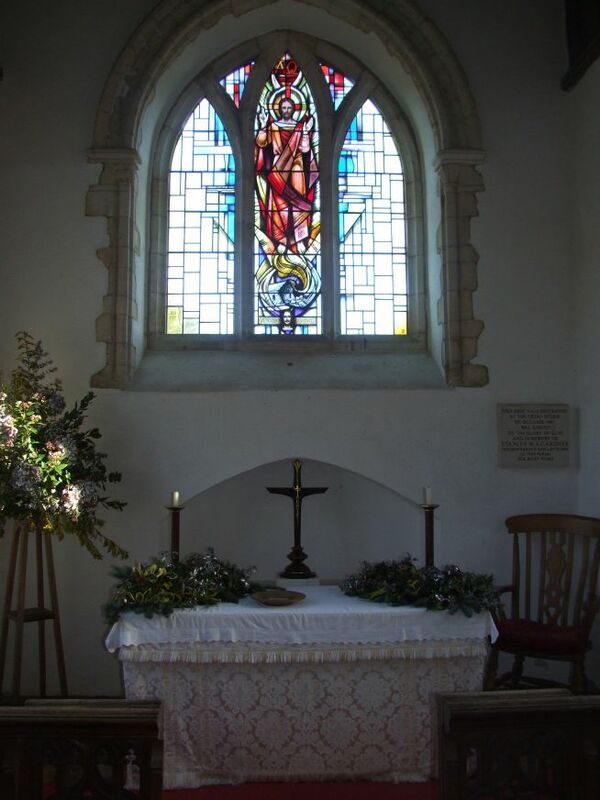 Rather, a lighter, airy modern window shows Christ ascending, and the curious face at the bottom is that of Christ from the former, blown-out window. The survival of this fragment among the rubble and masonry is spoken of locally as a miracle (albeit slightly ironically - after all, this is the Church of England). The south chapel is perhaps not really a chapel at all, but an aisle at arm's length. It is built of Tudor brick, and known as the Rowley chapel. But nothing here dates back before the mid-20th century. It contains a rather nice memorial with a roundel featuring a Suffolk Punch horse. The 15th century font is typically East Anglian, but it was recut in the 1840s in quite an interesting way. This is an early date in Suffolk for a Victorian restoration, and no attempt was made to make the font appear medieval - rather, it has been neatly lettered in black paint, and is now rather austere and impressive. The rood loft stairs curve sweetly behind the stepped pulpit. On my first visit, in 1999, the nice lady cleaning the stairs thought I was from the Health and Safety Executive when she saw me photographing it. I assured her that many Suffolk churches had more precipitous rood loft stairs than hers. Coming back in 2008, I was struck by just how beautifully kept the building is, with a real sense of being loved and cared for. I think that this must be a fine church to worship in, and thanks to the energy of local 'sporting parson' John Waller, into his benefice this falls, there is a service here nearly every Sunday. 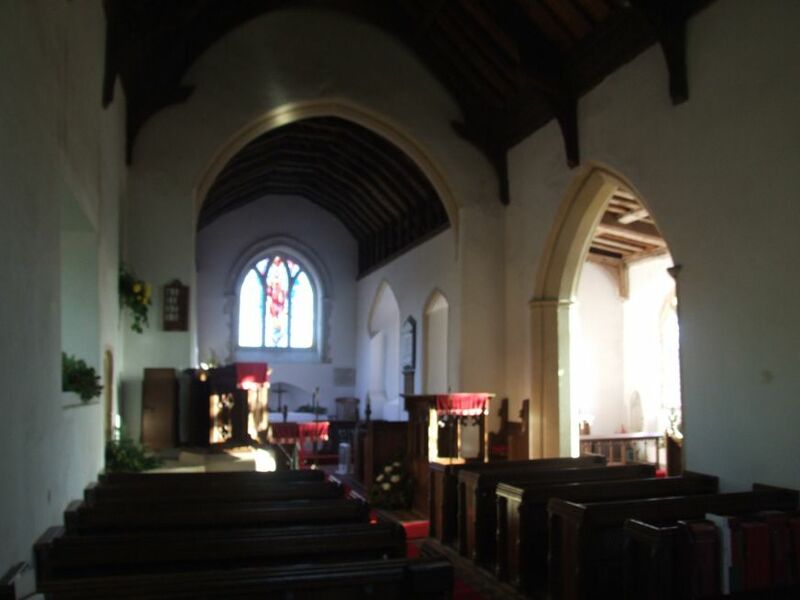 As with the other churches in the benefice, it is open to pilgrims and strangers every day. Just outside the porch, on the eastern side of the path, there are three 19th century gravestones to the Page family, and the third one is the gravestone of the Suffolk giant, George Page. It is rather faded now, but you can make out his name and title. He was 7ft 7in tall when he died in 1870, after a life spent in a travelling circus. The story goes that George joined a fair run by Samuel Whiting on May 1st 1869, together with his brother Meadows, who was about 7 ft 4 ins. George died in April 1870, and his inscription reads Sacred to the Memory of George Page, the Suffolk Giant, Died 20th April 1870, age 26 years. He was exhibited in most towns in England but his best exhibition was with his Blessed Redeemer. The gravestone inspired the 1926 novel The Giant of Oldbourne by John Owen, who lived at nearby Felixstowe. George's brother Meadows continued to tour until 1875, when his daughter was born. Apparently, a knife was left in their caravan; in the secret language of the fairground, this was a warning to get out. Meadows returned to his old job as a farm labourer, and died as recently as 1917.